Many of Nye’s Aerospace lubricants are designed specifically for satellite components and so must survive the severe conditions of the space environment, where long life is critical for the success of the mission. Our MAC/Pennzane™ based lubricants have orbited around the Earth and helped provide some of the most iconic space images. 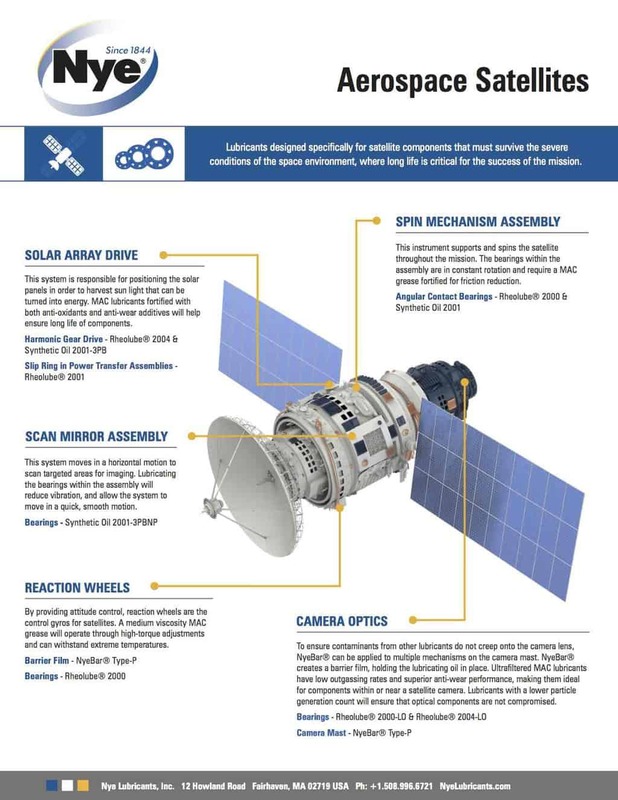 Our latest satellite overview document highlights various satellite components that have had success using Nye products, including solar array drives, camera optics, and reaction wheels. Take a look at the application overview to learn how our lubricants are ensuring long life of these critical components. This instrument supports and spins the satellite throughout the mission. The bearings within the assembly are in constant rotation and require a MAC grease fortified for friction reduction. This system moves in a horizontal motion to scan targeted areas for imaging. Lubricating the bearings within the assembly will reduce vibration and allow the system to move in a quick, smooth motion. By providing attitude control, reaction wheels are the control gyros for satellites. A medium viscosity MAC grease will operate through high-torque adjustments and can withstand extreme temperatures. To ensure contaminants from other lubricants creeping onto camera lens, NyeBar can be applied to multiple mechanisms on the camera mast. NyeBar creates a barrier film, holding the lubricating oil in place. Ultrafiltered MAC lubricants have low outgassing rates and superior anti-wear performance, making them ideal for components within or near a satellite camera. Lubricants with a lower particle generation count will ensure that optical components are not compromised. Please get in contact to find out how we can help you with your design/component.